Need a quick chocolate fudge recipe that's sure to impress? Try this two-tone cherry version made with—you'll never guess—Kool-Aid! Line 8-inch square pan with foil, with ends of foil extending over sides. Microwave semi-sweet chocolate and 3/4 cup milk in microwaveable bowl on HIGH 1 to 2 min. or until chocolate is almost melted, stirring after 1 min. Stir until chocolate is completely melted and mixture is well blended. Spread onto bottom of prepared pan. Microwave white chocolate and remaining milk in separate microwaveable bowl 1 min. or until chocolate is almost melted. Add drink mix; stir until chocolate is completely melted and mixture is well blended. Spread over semi-sweet chocolate layer. Refrigerate 2 hours or until firm. Cut into 25 squares to serve. 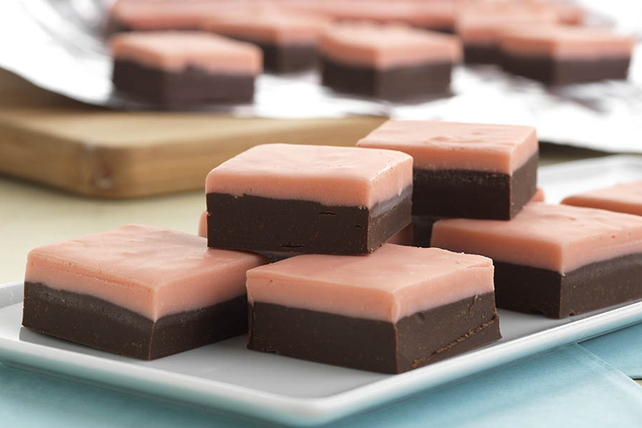 Balance out your food choices throughout the day so you can enjoy a piece of this creamy fudge.